From the kitchen of One Perfect Bite...Oranges and lemons and spice - how nice! Perhaps, but I wonder how many European Christmas treasures have been ruined using the glazed peels and citron that we buy for baking during the holidays. I, only recently, discovered that citron is a fruit, related to the orange and lemon, but with an identity all its own. I had always assumed that citron was candied lemon peel. Citron is valued for medicinal purposes and in the ancient world was mixed with wine as an anecdote to poison - if only Socrates and Seneca had known! While this may be a culturally acquired taste, my palate can't deal with citron, so I decided to follow the example of frugal peasant housewives around the world, and, working from an old recipe, make my own candied peel. What a treat! Fresh candied peel is a confection that will enormously improve stollen, panettone, cassata and Scandinavian Christmas breads, replacing bitterness with the true essence of the fruit. I was also delighted to find that Davis Lebovotiz had come up with a recipe to make crystallized ginger in home kitchens. Now between work, cooking, cleaning, decorating, shopping, wrapping and keeping the children entertained, you'll have something to fill your idle hours. My work here is done! 1) Cutting lengthwise, quarter the peel of oranges or lemons with a paring knife. Remove peel from each quarter, saving the fruit for another use. Place peel in a 4 to 6-quart pot; cover with cold water and bring to a boil. Simmer, uncovered for 10 minutes. Drain. When cool use a tablespoon to dig out most of the white pith. Cut the remaining peel into 1/4-inch strips and set aside. 2) Combine 2 cups of sugar with 1 cup of water in a medium saucepan. Set over medium heat, stirring to dissolve sugar. Add peel, cover, and simmer gently for 45 minutes. Remove peel; drain on a wire cooling rack and allow to dry for 1 hour. 3) Place peel and remaining 2 cups sugar in a large bowl. Toss until peel is evenly coated. Shake excess sugar from peel and place on a baking sheet; allow to dry overnight. Store in an air tight container for up to 2 weeks. Yield: 2 quarts orange or 1-1/2 quarts lemon peel. Mary,great post! This past summer I visited the island of Naxos and they have quite the Citron industry where they cultivate it for use in liqueurs and spoon sweets. Your candied peel is like a plate of little jewels. I agree with you about citron. I always wondered what that funky stuff was in so many fruitcakes I've sampled over the years. Lovely photo, Mary. You're amazing. 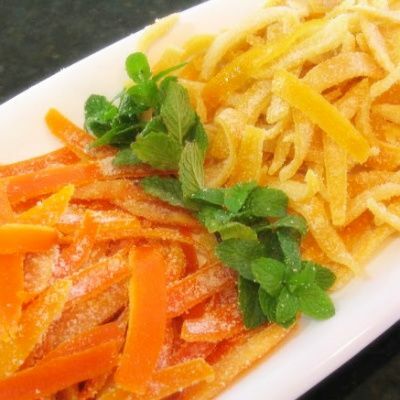 I've been doing candied orange and lemon peel for years. It is easy and so much better than anything you buy. But candied ginger, NEVER!!! But guess what I'll be doing this December! Thanks for another great post and sharing a great recipe. And yes, I learned long ago that citron was not lemon or orange and I am one of the few that actually likes it! This stuff is so good and so addicting! I love it! These are beautiful and does in deed look easy to do. Do you snack on these like candy or use them with other things? I have an abundance of thick-skinned pomelos growing in the back yard. I wonder how those would taste candied? I've never made candied orange or lemon peel before. Yours looks lovely and tasty - great photo Mary. Susan, the peel can be eaten as candy, but I prefer to it in breads and cakes. I do hope you'll try them. I know of folks who candy grapefruit peel, so why not pomelos? Thing is we never know until we try! Keep me posted. I just recently planted a citrus salad tree, hopefully will have 4 kinds of citrus in the summer. This is one of the things I plan to do with my harvest. Very pretty photos too. Lori Lynn, welcome. I just too a peek at your beautiful blog. I'll pop in often. Yum! Looks wonderful! And thanks for all your sweet compliments! Your candied citrus peel is really pretty! I like the mint garnish too. And candied ginger, ohhh that is intriguing! I never thought to try it at home but then again, why not? Mary, what a great way to use the orange and lemon peels. I do like citron and use it in a German Christmas cookie that is about 200 years old pasted down by my husband's side of the famly. I love candied peel, I also love to make them myself. I think they taste much better! Elra, welcome to One Perfect Bite. I've just had a peek at your beautiful baking site. You've done a nice job over there. I hope you join us more often. Nice! I already decided I need to make my own this year for panettone, because it's been becoming harder and harder to buy and this yeasr I can't find it at all. Now I know how to do it! Candied peel is so good! I haven't tried making my own so I'm excited to have a recipe now. I had been looking everywhere to buy those candied orange and lemon to make stollen but I can not find them anywhere. I guess I have to borrow your recipe and make my own.... Yours looks beautiful.